What is 5 (TIMES 4)? 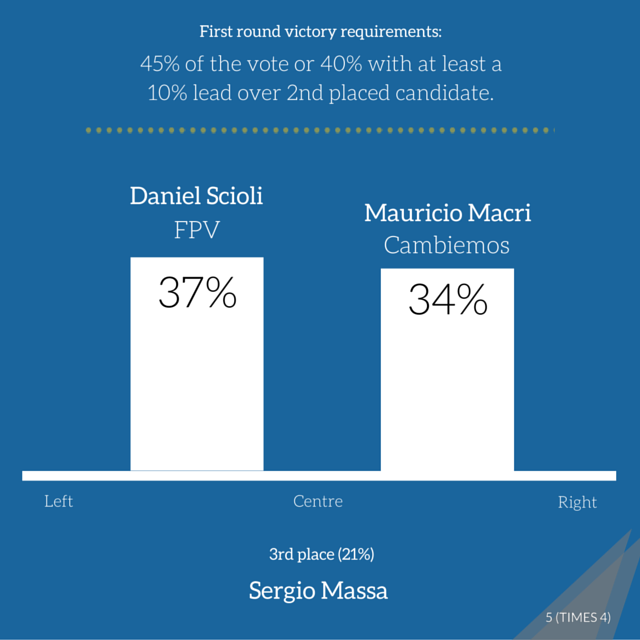 Argentina will hold its first presidential run off on November 22nd after no candidate reached the required threshold in Sunday's election to replace the outgoing Cristina Fernández de Kirchner of the Front for Victory (FPV). A judge in Buenos Aires has rejected a prosecutors request to formally charge Cristina Fernández de Kirchner for allegedly covering up Iranian involvement in a 1994 terror attack on a Jewish centre that killed 84 people. Judge Daniel Rafecas said that evidence complied by the dead prosecutor Alberto Nisman was not substantial enough to proceed with a case against President de Kirchner. Earlier, Argentina's Congress passed a bill dissolving the country's intelligence agency in the wake of the Nisman scandal. The Intelligence Secretariat will be replaced by a new federal agency. An introduction to the Nisman Scandal - in 15 seconds. Tens of thousands of people attended a silent protest in Buenos Aires on Wednesday evening to mark one month since the apparent murder of prosecutor Alberto Nisman, who died hours before he was due to testify that the government was covering up Iranian involvement in a 1994 terror attack. The exact turnout figure was unclear, with differing numbers given by different officials; there were also protests in other Argentinian cities. President Cristina Fernández de Kirchner accused of conspiring to cover up Iranian involvement in an attack on a Jewish centre that left 85 people dead in 1994 to maintain strong Argentina-Iran ties. Similiar accusation was levelled at de Kirchner and her government by prosecutor Alberto Nisman. Nisman was found dead in his home last month hours before he was due to testify about the alleged cover up. Today, prosecutor Gerardo Pollicita requested that the President and a number of other top officials be formally charged/indicted. His death know thought to have been murder, disguised as suicide. The President believes that Nisman was fed false information by Antonio Stiusso, who was once the director of Intelligence Secretariat - the intelligence agency that de Kircher now wants to be dissolved. She claims that the intelligence agency were involved in Nisman's death in an attempt to implicate her.